Please note that Disney provided our tickets and our lunch cards to facilitate our review. However, all opinions are 100% my own. The family and I had the chance to head out to Disney’s Blizzard Beach water park to explore some of the fun things they have to offer. We spent the whole day checking out the park and enjoying all they have to offer. I am going to take a few minutes to share some Blizzard Beach tips and tricks. I also hope to answer some of your questions about the park. These tips come from our experience in the park. If you have additional tips, please comment and let me know so I can update this post. Are there any character meet and greets at Blizzard Beach? One of the things Disney is most known for are their character meet and greets. There’s just something about seeing a character come to life that you have seen in your favorite movies. At Blizzard Beach you can meet Goofy. The best part about the Goofy meet and greet is that it is at the beginning of the water park so that you can get a great picture before heading into the water. Are there any good photo opportunities at Blizzard Beach? One of the amazing things about this water park are all of the amazing opportunities to get a fun picture. Whether you are snapping a pic with a family of snow people or standing in front of a giant Mickey made of pool floats, you are sure to get some amazing pictures! How much are lockers at Blizzard Beach and how big are lockers at Blizzard Beach? If you are thinking about bringing a camera for fun pictures or bringing your phone to catch up with someone you may want to purchase a locker. A small locker rental is $10 and a large rental is $15. You can pay for your locker with cash or cards. The $10 locker held my DSLR camera bag, my phone and I could have put more in there. The $15 locker could hold 2 backpacks. How can I stay hydrated at Blizzard Beach? There are a few options to stay hydrated in the summer heat at Blizzard Beach. You can pack your own water bottles. I suggest freezing them so they melt throughout the day and you can continue to enjoy cold drinks. There are also water fountains around the park and most restaurants will give you a cup of water. If you are after the best value for your money, the cup pictured above is $11.99 plus tax and will give you free refills for the entire day! Talk about a great way to enjoy a cold drink and take home a souvenir. What food options are there at Blizzard Beach? There are multiple restaurants at Blizzard beach that you can try out. Whether you grab a foot long hot dog at Avalunch or eating a Blizzard Cheddar Burger at Lottawatta Lodge you are sure to find a filling meal for a reasonable price! Are you a vegan or a vegetarian? Lottawata Lodge has menu options just for you! You can also bring in your own food as long as you don’t bring in glass bottles. Do I need to wear shoes at Blizzard Beach? Flip flops or swim shoes can be a help but they aren’t required. Blizzard Beach does two things to help keep your feet cool in the park. There is ample shade to help keep the sidewalks cooler. They also have water sprayers on many of the paths to spray your feet with cool water and keep the ground cooler. Are there options for preschoolers at Blizzard Beach? One of the fabulous things about Blizzard Beach is that many of the areas are fun for the whole family. That said, you can also take your youngest adventurers to Tike’s Peak which is an area designed just for them! Feel free to grab a lounge chair and watch your little one have a blast. What options are there at Blizzard Beach for elementary aged kids? If you want to let your older kids have a ton of fun, take them over to Ski Patrol Training Camp and grab yourself a comfortable chair or go play in the water with them. They can go down water slides, challenge an obstacle course, or go down a zip line! They even add a dance party to the mix for a really fun experience. Are life jackets provided at Blizzard Beach? Life jackets like the ones pictured above are provided at the entry of areas where they will be needed. These are free and are very helpful in the wave pool and lazy river. Where can I cool off and relax at Blizzard Beach? Is it getting a bit warm for you? Want to skip out of the thrill rides or wave pools? Make sure to head over to the lazy river that is almost a mile long. Grab a float and sail away. There are even some fun areas where you can get cooled off with some special surprises. I honestly could have floated around this all day and not moved to anything else. How intense is the wave pool at Blizzard Beach? We are huge fans of a good quality wave pool but some can be a bit rougher than others. The Blizzard Beach wave pool does something really fun! They let you go out in pool floats and ride on the waves. I do recommend making sure younger children wear a life jacket as it can get rougher the deeper you go. Are there fun options for families at Blizzard Beach? With rides like the ones above families can have a ton of fun together racing or laughing down a water slide. With so many family friendly rides there will be multiple chances to spend some good quality family time. Are there options for people who don’t want to climb at Blizzard Beach? If you are thinking about riding Summit Plummet but don’t want to climb the stairs they have a fun option for you. You can ride the ski lift up. What if I forget my towels at Blizzard Beach? You can either rent a towel or buy your towels from the gift shop for a fun souvenir. I am a big fan of the orange Mickey one. What if I lose my child at Blizzard Beach? Blizzard Beach has an amazing system in place to help take care of a situation where children might get lost. They will entertain your children at this hut while they coordinate with security to get you safely reunited with your child. Check out our YouTube Video to see more! Ever since my daughter saw the first teaser trailer for Christopher Robin the house has been a Winnie the Pooh house. It kind of fits because my daughter had a Winnie the Pooh nursery as a baby. Pooh just has so many fantastic quotes and fun life lessons. 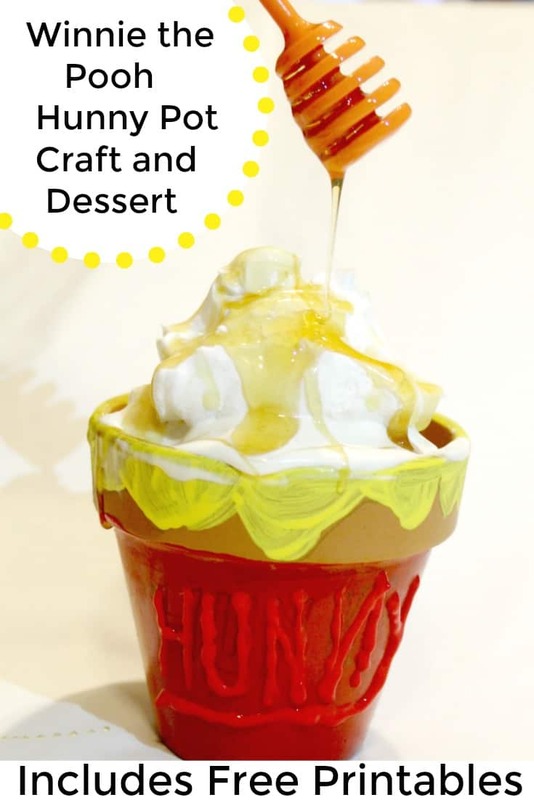 We decided to put together this Winnie the Pooh Hunny Pot to enjoy a sweet treat and then decorate her room. Make sure to read past the craft to score your free Winnie the Pooh printables! I did receive 4 tickets to Toy Story Land for my family. However, all opinions here are 100% my own. What should moms know about Toy Story Land?